Damien Berry (born October 21, 1989) is an American football running back Baltimore Ravens National Football League. 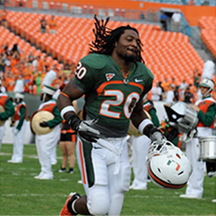 He played college football for the University of Miami, where he was the team’s leading rusher in 2010 and a second-team All-ACC selection. He was signed by the Ravens as an undrafted free agent in 2011.